Twenty-five years ago one of the most exciting rally stories of all time ended. 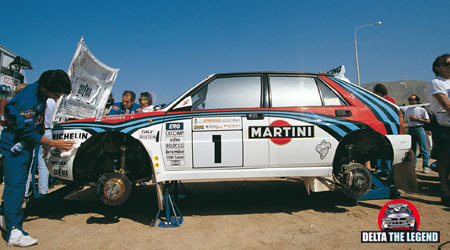 After years of absolute dominance, the star of Lancia Delta went out, after a last season of legend that led to the sixth consecutive title in the World Championship. 8 victories, 21 podiums and 4 doubles! A triumph announced and then realized with tenacity, race after race, with a car (the Lancia Delta HF Integrale) destined to remain forever in the mind and in the heart of all. The most incredible thing of the season was that the Lancia Delta HF Integrale reached the podium in all ten races included in the constructors’ championship! The only regret will be the lack of success in the drivers’ standings, with Juha Kankkunen and Didier Auriol behind Carlos Sainz. The only flaw in a season where on several occasions we shaved the absolute perfection. It is December 18, 1991. The Lancia Delta is at the top of its racing success: it is the absolute queen of the rally, the dream car, with the strongest drivers, with the most experienced team. 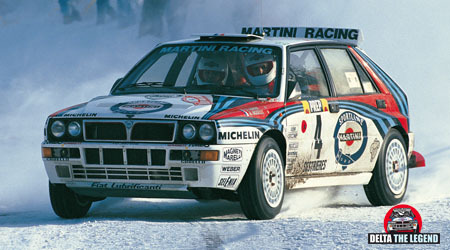 However, from Turin, a press release has just been issued announcing that Lancia will suspend the competitive activity. “Because?”! This is the inevitable and pounding question that rebounds from mouth to mouth among fans. And it was so, beginning with the most anticipated race, the Monte-Carlo, 23/28 January 1992. 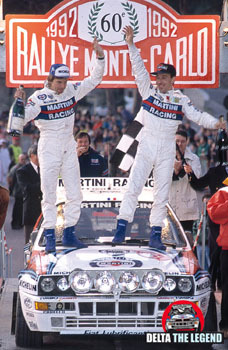 Didier Auriol won the Monte Carlo Rally with the number 4 plate. 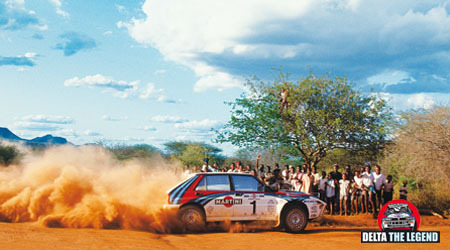 This was the same as the one given to Juha Kankkunen in Portugal, where the Finn dominated 13 stages to clinch a victory that was never in discussion: Abarth engineers had accomplished another miracle by producing another successful version of the Delta, the fourth after the 4WD, the Integrale and the Integrale 16V. Like his team-mates Juha Kankkunen and Philippe Bugalski, Didier Auriol was also in difficulty on the icy roads of Sisteron-Thoard, and had to let Carlos Sainz take the lead. 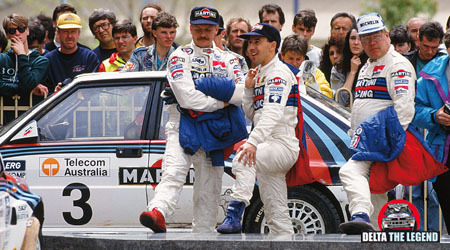 But this setback did not prevent the man from Millau, who made a storming recovery in the final stages, from climbing onto the bonnet of his Delta HF with co-driver Bernard Occelli to celebrate another Lancia win in the Principality of Monaco. 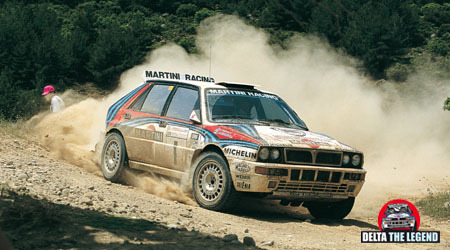 This was his second after the one he had clinched two years before with the Delta HF Integrale. Andrea Aghini came back down to earth with a bang in Portugal in just his third rally with the Delta and on his debut with Martini Racing. A potentially sensational result went up in smoke when he lost a wheel on the first stage of the final leg. Two months later, things went slightly better for Juha Kankkunen at the Acropolis Rally: on the rocky roads of Greece, electrical problems prevented him from fighting with Didier Auriol, but at least he picked up15 points for second place, which put him in the lead of the1992 world championship at the half-way point. And then there are the races where Lancia Delta is unattainable, for all its rivals. The 1992 Acropolis Rally was totally dominated by the Lancia Delta HF machines, with Didier Auriol-Bernard Occelli winning from Juha Kankkunen-Juha Piironen. The two Martini Racing crews celebrated at the end of the race: being rivals in the title battle did not prevent these four superstars from enjoying the spoils of victory together. From Portugal to the Acropolis to Corsica, the song stayed the same: the Martini Racing ‘Super-Delta’ continued to dominate on the roughest of roads, like the tricky ones on the Mediterranean island. 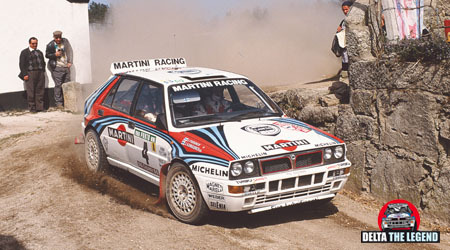 Juha Kankkunen was unbeatable in Portugal, while teammate Didier Auriol took the top podium slot in Argentina and Corsica. FIA President Jean-Marie Balestre was in Ajaccio to celebrate his victory. The season continues triumphantly until reaching the sixth consecutive title at the World Championship. Meanwhile, enjoy the video of the 1992 season. The last year, the last chapter of the Legend.